While I’ve been struggling with French, Craig has learned British. It started innocently enough…..craving to hear our native tongue, we switched the satellite dish from French television to English. Soon, Craig began saying he was “a bit peckish” as meal time approached. Then other words started creeping into his vocabulary….. He now carries a “mobile”with him, complains about the “lorries” on the roads, watches the “telly” and has a “cuppa” in the morning. As abysmal as my French is, it’s started to supplant my English. I no longer remember the English word for “gazeuse,” I stumble on the American term for “bio” and I’ll need to remember that (unless I’m in England), no one will know what a “courgette” is. Today was a melancholy day. We moved the boat to it’s new home at Port la Robine….another indicator that our time here is ending. Oh, well, guess I know what he needs for Christmas. Dinner was Austrian Tafelspitz (beef simmered with root vegetables) served with applesauce, horseradish and egg noodles. Not only did this diminish our reserve of applesauce, horseradish and egg noodles, we used the leftovers as a base for Italian Minestrone…..helping to empty the cupboard of stewed tomatoes, kidney beans and penne pasta. It was truly a United Nations evening. Too bad the cottage reeked of bleach. It’s a funny thing about emptying out the larder…..you have to add to it to deplete it. So today we made the trek to E. LeClerc in Narbonne to (minimally) restock the pantry. We’ve driven these familiar roads many times, but today we saw things in a different light…..the massif of La Clape standing proudly in the distance, chateaux hidden behind barren vineyards, shiny bronze lamp posts lining the streets of Narbonne. It seemed we were seeing this beautiful countryside for the first time. Why does impending loss make you so acutely aware of what will be missed? Despite our wistful thoughts (or maybe because of them), we continued making good progress on the larder today. Gone…..one bottle of port, a package of chicken from the freezer and a jar of tangy German apple jam (put to delicious use as a cake filling). The cake recipe called for two pans. 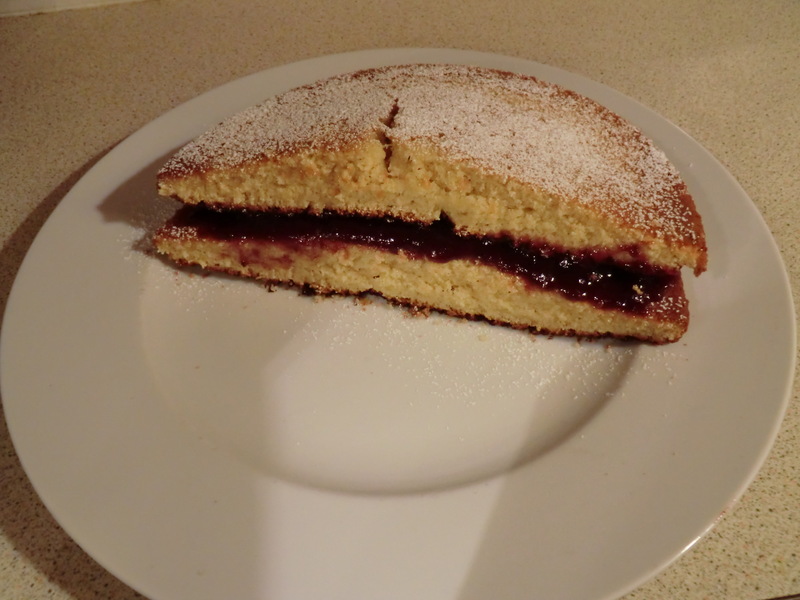 Having just one pan, I halved the recipe….. intending to horizontally cut through the final result, fill it with that delicious jam and top it with the remaining half layer. 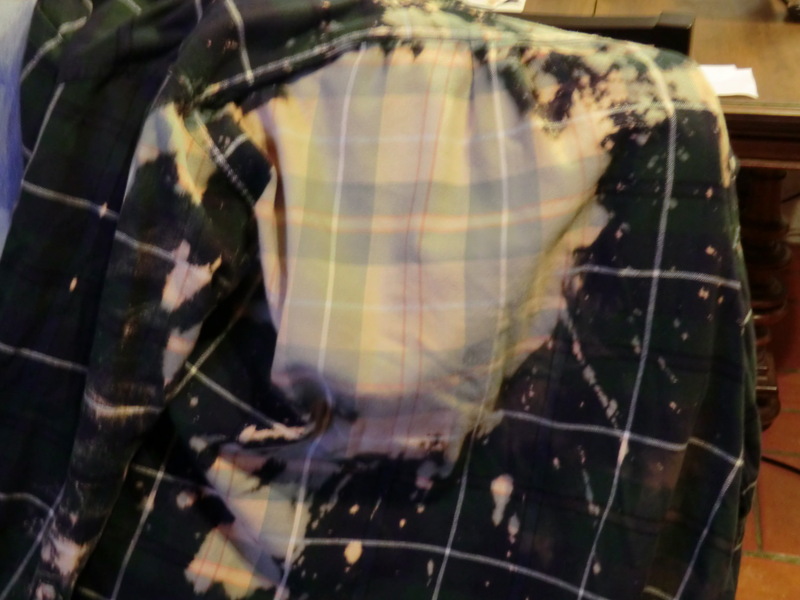 But the cake didn’t rise (“Uh….Craig, who changed the oven from ‘bake’ to ‘grill’?”). Any attempt to cut through this pathetic little layer would have resulted in a plateful of crumbs. Dejectedly, I was getting ready to make another layer…..but, in a flash of utter brillance, I cut the cake vertically instead of horizontally, spread the jam on top of one skinny half, layered the other skinny half on top and…. voila! A perfect (albeit short) half-cake…..
We woke to a beautiful blue sky…..the first one we’ve seen in weeks…..but we couldn’t enjoy it to it’s fullest. We had to get on with the task at hand….emptying the cottage of the things we’d brought and the things we’d bought. We’re confident that everything we brought over here will be going home with us. The rub arises with the things that we’ve bought to make life in the cottage a little more comfortable. Some of it was bought with the understanding that it would serve us well on the boat, so that’ll be the new home for dishes, bowls and assorted kitchen utensils. But what to do with the items geared for life on land…..chairs, heater, air purifier, air mattress? We staged a little photography shoot in the front room and loaded the resulting pictures on an Expat website…..hopefully they’ll find new homes soon. With that done, we sat down, opened a packet we’d just received from my former employer and began the arduous task of poring over our health insurance options for next year…..HMO, PPO, medical, dental, vision…..various choices ranging from $1,200 – $2,100 a month!!! We’re paying less than $4,000 a year for insurance over here!!!! I don’t want to get into a philosophical diatribe, but something’s very wrong here. France’s government-run health care system works just fine……thanks to my broken leg, I can say that from personal experience. From the emergency room to the surgery to the follow-up care and physical therapy, their system was easy to navigate, flawless and inexpensive…..even for someone who didn’t speak the language. People over here can’t understand why Americans are so adverse to the concept of government-run health care. We tell them that too many Americans fear the unknown and figure “if it ain’t broke, don’t fix it.” What these people just don’t get is that it is broke…..very, very broke. After this depressing chore, it was definitely time for a drink (it’s good for the heart, right? ), so we finished off the last of the Lillet….chilled, with a twist of orange. 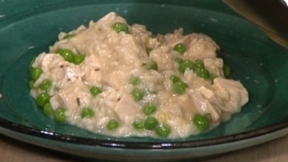 In a better frame of mind, I tackled dinner…..making good progress on emptying the larder using Gino D’Acampo’s recipe for Chicken and Pea Risotto (substituting Camargue red rice for the arborio rice). 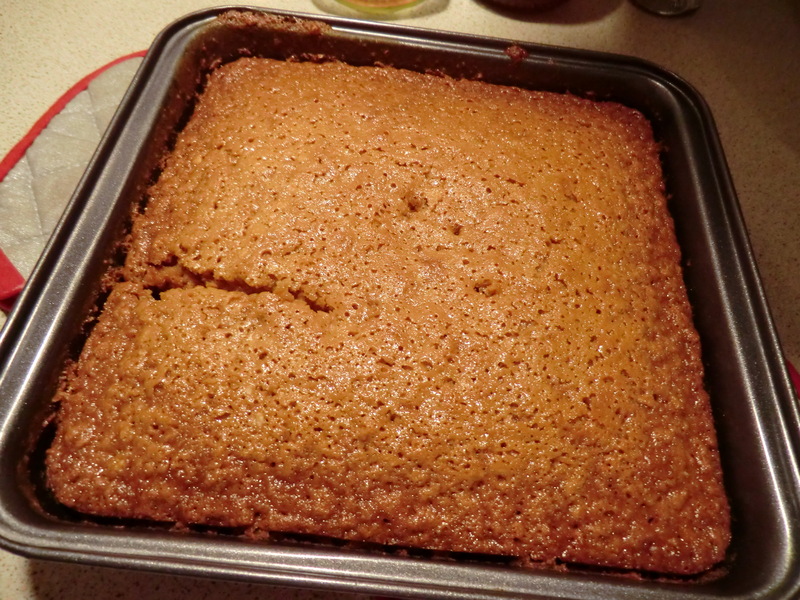 For dessert, we had PARKIN, a British ginger-oat cake (and a great way to finish off our tin of Lyle’s Golden Syrup). Neither dish was much to look at, but both were delicious….especially so with our last bottle of Le Téméraire…..a toothsome blend of whites by one of our favorite local wineries, Domaine de la Provenquiere. 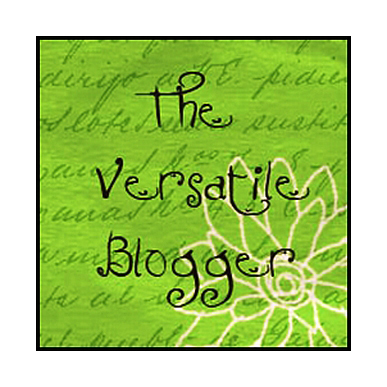 I was surprised and flattered this morning when I received the “Versatile Blogger” award from Two Black Dogs, a blog created by Sam…. a young woman in Australia who writes passionately and eloquently about her loves of travel and animals. She’s a kindred spirit who’s blog I very much enjoy reading…..and I’m delighted that she finds some worth in mine. Thank you, Sam…..you made my day! Along with the honor of being presented with this award, it comes with some niggling little rules…. Rule #1: Thank the award-giver and link back to them in your post. Again….thank you, Sam. The musings, stories and photos you post in Two Black Dogs have been a highlight of mine. I love reading about your trips and your life in Australia. Your blog has been both entertaining and informational…..it was through your blog that I first learned of the devasting floods in Vernazza and of the plight of poor Lennox (I’m hoping he’s returned to his family soon). Rule #2: Share 7 things about yourself. I love the sound of water…..rain on the roof, waves breaking on the shore, streams gurgling over rocks, the splashing of fountains…. I stayed up way too late last night and was totally exhausted when my head finally hit the pillow. Sleep didn’t elude me, it came quickly…..but not soundly. Our uninvited visitor was in the walls….scritching and scratching away. Craig was raised on a farm….maybe that’s why he’s able to ignore the hideous sound this creature makes…..but to me, it’s like fingernails scraping against a blackboard. Once awake, the sound intensified…..drowning out all normal sensibilities. I couldn’t sleep, I couldn’t think….all I could do was focus on the loathsome sound coming from the inside the walls. The scratching got louder and louder. What nature of beast was this…..Mondo Mouse? Rabid Rodent? Vengeful Vermin? Despite my lack of sleep, I continued on my quest to empty the larder…..successfully finding a recipe that would use a good portion of our pastis (an anise-flavored liqueur), olive oil, all the basil remaining in our garden and a package of chicken from the freezer. Chicken with Pastis from “French Women Don’t Get Fat” and an Apricot Clafouti (using a lone can of fruit from the cupboard and Apricot Brandy from the Wachau Valley) made for a delicious feast. So delicious, that I just may have to add pastis to the larder back at home.